Do you have a favorite place where you like CHAOS? Who could possibly say they like any chaos anywhere? Well, I have a favorite place that I like CHAOS! I am as far away from being OCD as anyone I know. I’ve been around people that are obsessed with neatness and surprisingly I am not one of them. I have come to terms with what I call being NORMAL. I like order but it does not drive me nuts if things go upside down occasionally. I like having things I need and use otherwise I feel like I am depriving a thrift store from making a profit off my unused stuff and their mission is not being fulfilled. I rejoice in finding something I have overlooked for years and eagerly bag it up and take it to my favorite thrift store, Helping Hands in Bothell, WA. They take some of their proceeds to Peru and through their efforts they are transforming a village and the lives of men, women and children. 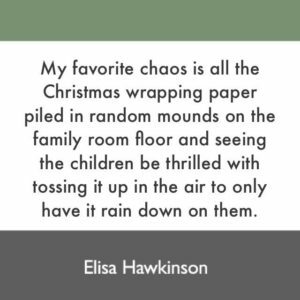 My favorite chaos is all the Christmas wrapping paper piled in random mounds on the family room floor and seeing the children be thrilled with tossing it up in the air to only have it rain down on them. As a newly blended family with adult children and step grandchildren I’ve had to instruct them all to please leave the Christmas paper lying all around the floor. 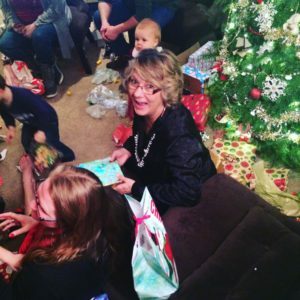 Waking up the morning after the unwrapping fills my heart with joy in seeing the Christmas wrap still tossed all over the floor. It makes me a bit sad to bag it up and toss it away. So where is your favorite place to have Chaos? I think that adds balance to our lives when we can be a bit crazy at times and this is my bit of crazy, nuttiness. Whatever your traditions are, I wish only blessings on you and your family this Christmas season.